If you are looking for a way to download your favorite YouTube videos to your computer, look no further. 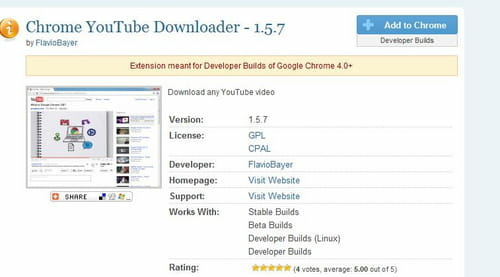 The Chrome YouTube Downloader browser extension offers a simple way to save all of your favorite content on your computer for offline viewing. In this article, you will learn how to download and install the unofficial browser extension to your computer. Note that use of this extension requires Google Chrome version 4.0 or higher. Open Google Chrome and head to the extensions page. Once the extension is installed, head to YouTube and find the video you'd like to download. Videos will download just like any other file on Google Chrome. Published by deri58. Latest update on September 2, 2016 at 08:04 AM by Olivia Long. This document, titled "How To Download YouTube Videos on Chrome," is available under the Creative Commons license. Any copy, reuse, or modification of the content should be sufficiently credited to CCM (https://ccm.net/).